Hotel Park Ocean, Jaipur, located in the heart of the city, is a short distance away from Sikar Road, Jaipur . 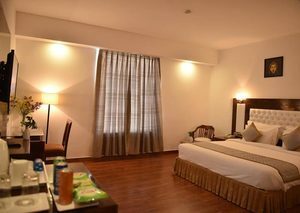 The hotel is easily accessible from the railway station (2.50 kms) and the Ajmer-Delhi National Highway (3 kms). It is in close proximity to major tourist attractions like Jantar Mantar, Hawa Mahal, City Palace and the walled city of Jaipur. The hotel offers an roof top pan-Asian restaurant – Republic of Noodles, a hip recreation bar – Slounge, a 24x7 multi-cuisine coffee shop – five senses restro lounge, business center, a 2200 sq. ft. of conference area, the rejuvenating spa – Fresco, a rooftop swimming pool to keep you feeling fresh. For more details, Please visit the page: httpwww.hotelparkocean.com. You can even send us an inquiry mail at reservation@hotelparkocean.com. For telephonic conversation, contact us at 0141-2337787.